A team of scientists from Cardiff, Bristol and Texas A&M universities braved the lions and hyenas of a small East African village to extract microfossils in samples of rocks which show the level of CO2 in the Earth's atmosphere at the time of the formation of the ice-cap. Geologists have long speculated that the formation of the Antarctic ice-cap was caused by a gradually diminishing natural greenhouse effect. The study's findings, published in Nature online, confirm that atmospheric CO2 declined during the Eocene - Oligocene climate transition and that the Antarctic ice sheet began to form when CO2 in the atmosphere reached a tipping point of around 760 parts per million (by volume). Professor Paul Pearson from Cardiff University's School of Earth and Ocean Sciences, who led the mission to the remote East Africa village of Stakishari said: "About 34 million years ago the Earth experienced a mysterious cooling trend. Glaciers and small ice sheets developed in Antarctica, sea levels fell and temperate forests began to displace tropical-type vegetation in many areas. "The period, known to geologists as the Eocene - Oligocene transition, culminated in the rapid development of a continental-scale ice sheet on Antarctica, which has been there ever since. "We therefore set out to establish whether there was a substantial decline in atmospheric carbon dioxide levels as the Antarctic ice sheet began to grow." The team mapped large expanses of bush and wilderness and pieced together the underlying local rock formations using occasional outcrops of rocks and stream beds. Eventually they discovered sediments of the right age near a traditional African village called Stakishari. By assembling a drilling rig and extracting hundreds of meters of samples from under the ground they were able to obtain exactly the piece of Earth's history they had been searching for. Co-author Dr Gavin Foster from the University of Bristol Earth Sciences Department said: "By using the rather unique set of samples from Tanzania and a new analytical technique that I developed, we have, for the first time, been able to reconstruct the concentration of CO2 across the Eocene-Oligocene boundary - the time period about 34 million years ago when ice sheets first started to grow on Eastern Antarctica. " The new findings offer important lessons for the future and will add to the debate around rising CO2 levels in the earth's atmosphere as the world's attention turns to on UN Climate Conference, which opens in Copenhagen later this year. 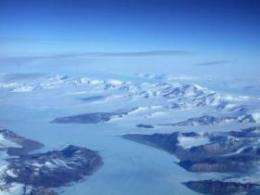 Co-author Dr Bridget Wade from Texas A&M University Department of Geology and Geophysics added: "This was the biggest climate switch since the extinction of the dinosaurs 65 million years ago. "Our study is the first to provide a direct link between the establishment of an ice sheet on Antarctica and atmospheric carbon dioxide levels and therefore confirms the relationship between carbon dioxide levels in the atmosphere and global climate." Has the mystery of the Antarctic ice sheet been solved? Conversely, since the ice cap formed in Antarctica as a result of the tipping point of 760 ppm CO2, we should have no fear of a catastrophic melt of the Antarctic ice cap in our own day. This is especially so when our CO2 level is well below that tipping point and at a level of less than 385 ppm! We would nearly have to double our current average global CO2 level to reach the tipping point again--if the science is right, that is. And, the tipping point is where the ice cap began to form. That observation would also, if we forget about hysteresis for a moment, be the end of the ice-cap. Not the start of it's melting, which is already observed. The next likely tipping point for Antarctica is IIRC that the western ice cap melts, not the whole of it. The western ice cap differs from the east, it is subjected to sea water. This will push the needed CO2 forcing way down. And that event would be bad, as it would drown huge areas of land and islands. Sorry about the bad HTML format of the intended quote. Now there are mechanisms that push back the disappearance of the last remnants of the ice cap. The likely hysteresis is one. Another is the missing piece of information in that article: plates have changed considerably over 34 million years. "India started to collide with Asia beginning about 35 Ma, forming the Himalayan orogeny, and also finally closing the Tethys Seaway; this collision continues today. The African Plate started to change directions, from west to northwest toward Europe, and South America began to move in a northward direction, separating it from Antarctica and allowing complete oceanic circulation around Antarctica for the first time, causing a rapid cooling of the continent and allowing glaciers to form. [Wikipedia: "Pangaea"; my bold.]" If the above is correct, and without having looked at the actual research, it is nevertheless IMHO doubtful that the measured CO2 forcing was primarily responsible for Antarctica ice caps. It might instead be a consequence of indirect forcing from plate tectonics, as the plants on for example Antarctica disappeared. Part of the problem is that other factors are not taken into account. For example, one side of the Antarctic still appears stable whereas the other side is showing some degree of melt. We do know that there is an active volcano on the side that is melting, which volcano last blew a hole through the Antarctic ice c. 325 CE. Nonetheless, I cannot see evidence for a catastrophic melt of any kind coming from Antarctica any time soon, as the predictions claim.